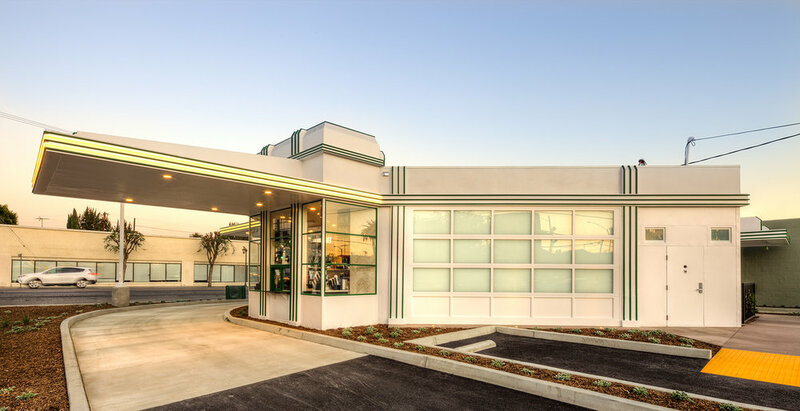 The Streamline Moderne former Gilmore Gas Station, built in 1935, was comprehensively rehabilitated and creatively reimagined as a drive-thru and walk-up coffee shop for the Melrose neighborhood in Hollywood. Designated as a Historic-Cultural Monument in 1990, the gas station had been a backdrop for famous film and photo shoots including Herb Ritts’ 1984 “Fred with Tires”. It closed in the 1990s and was vacant until Chattel worked with Starbucks, Valerio and a team of specialists to develop a rehabilitation plan that brought this beloved neighborhood landmark back to life. Chattel’s first task was to perform a Historical Resource Assessment and evaluate the proposed project for historical resources impact under the California Environmental Quality Act (CEQA). Through primary and secondary source research of the property and analysis and review of the project plans, Chattel designed mitigation measures to ensure conformance with the Secretary’s Standards for the Treatment of Historic Properties and therefore a less than significant impact on historical resources under CEQA. The project required remedial environmental cleanup, repair and reconstruction of historic materials, such as the cantilevered canopies, removal and replacement of incompatible alterations, and transformation of windows and doors to service counters. Spectra performed critical rehabilitation and reconstruction work. The sensitive adaptive reuse of the Gilmore Gas Station has revitalized this important Historic-Cultural Monument as a newly imagined "fuel" station. The project received a 2018 Los Angeles Conservancy Preservation Award and a 2018 Preservation Design award for Rehabilitation from the California Preservation Foundation.